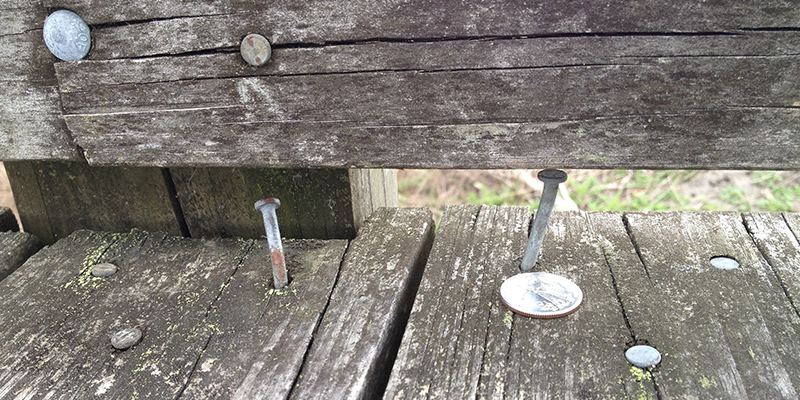 Many owners familiar with boardwalk systems face the same question: "How can we minimize the maintenance costs on our boardwalks?" As you've probably researched already, the biggest selling points for our PermaTrak system are the durability and lack of maintenance your client will need to pay for over 5, 10, 30 years. Per Army Corps of Engineers, reinforced precast concrete has a design life of 50-75 years. All boardwalk suppliers will tell you their systems are low maintenance, but if you look into the potential for slippery boards, splinters, cupping, warping, rotting, etc. you'll find that maintenance problems will inevitably occur over time. Using an older, well known building material like precast concrete helps eliminate that maintenance problem many owners face. Designers and owners will ask us: "What maintenance do you recommend for PermaTrak? Or is there no maintenance recommended at all?" The simple answer is: "You could pressure wash it annually or every couple of years. 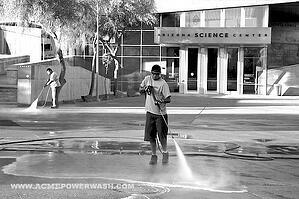 We do not recommend any maintenance, other than an optional power washing once every several years." In many cases, cleaning a concrete surface is limited to hospitals, office buildings and high-end condominium complexes. The cleaning usually takes place at the front entrance and is strictly for aesthetics. Boardwalk decking products require maintenance when the material becomes functionally or structurally in need. On commercial boardwalk applications, that point is reached rather quickly with softwoods like Southern Yellow Pine or with composite lumber (plastic decking). Heavy pedestrian traffic, bicyclists, UV exposure, coastal environments, and freeze/thaw cycles can expedite the deterioration of these products. 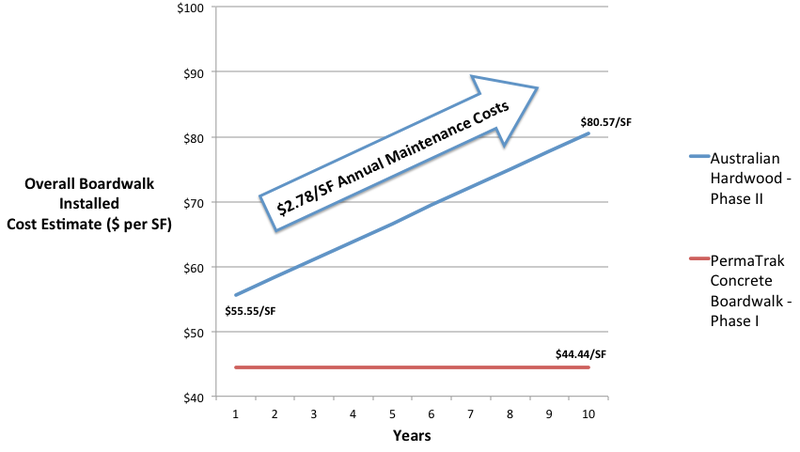 The following maintenance cost comparison was generated by Hamilton County Park District in Hamilton, OH. The application involved a narrow 160' wetland boardwalk leading to a 40' observation deck. The design live load requirement was pedestrian only. 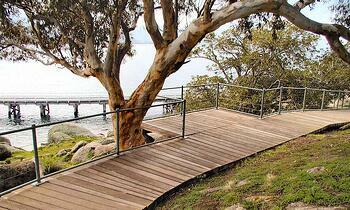 A pressure treated timber boardwalk system was given a life expectancy of 16 years. After 16 years of use, the structure was to be demolished and replaced. You can see the hike in life cycle structure costs at year 16 on the graph below. The County accounted for a timber boardwalk powerwash and sealer application every 4 years, estimated at $1.50/SF. Lastly, maintenance funds were allocated new screws/tightening old screws, and replacing individual boards once they had deteriorated or warped too badly. The County planned to powerwash the PermaTrak wetland boardwalk once every 4 years at a cost of $1/SF. This was the only maintenance item presented. 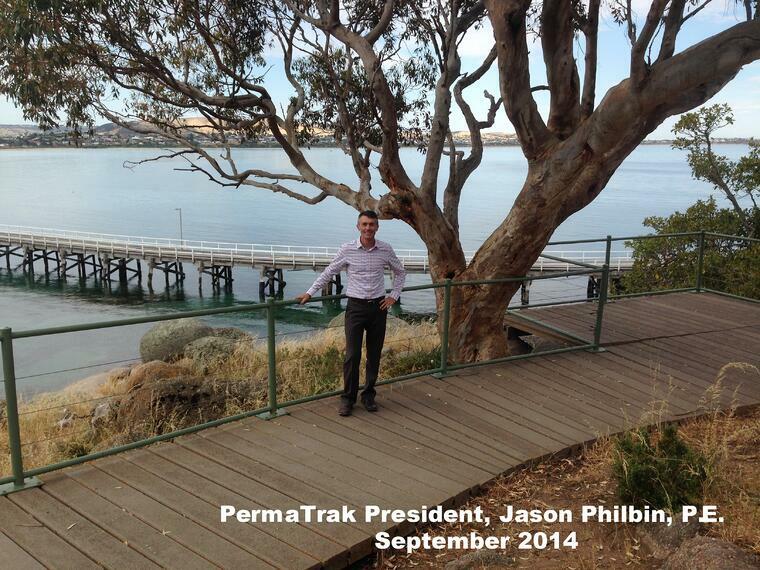 After 20 years, the cost of the timber structure was roughly 2x that of PermaTrak's wetland boardwalk. 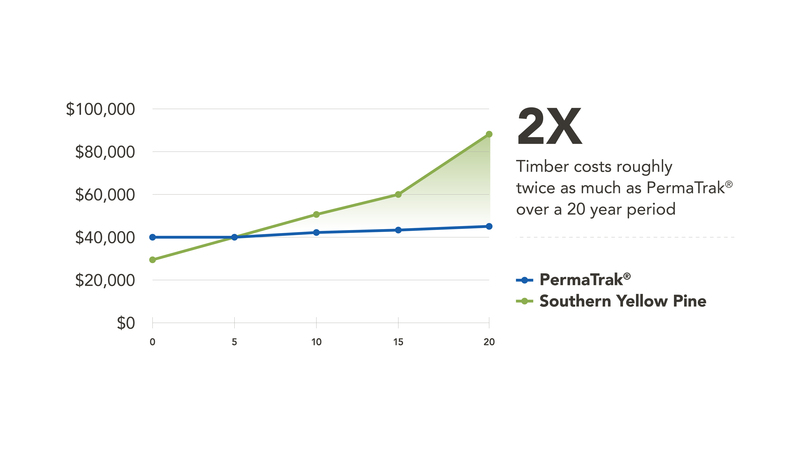 After 40 years, a timber structure would cost the County over 4x that of the PermaTrak structure. 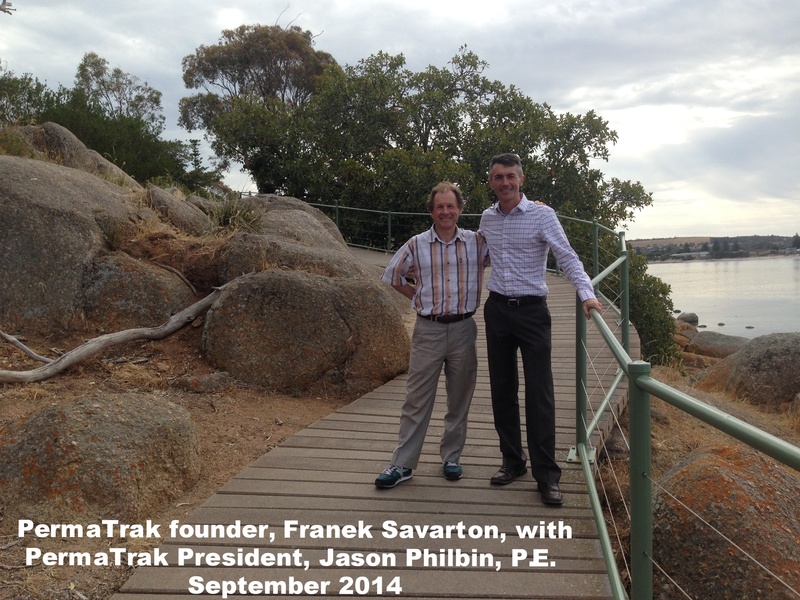 The PermaTrak boardwalk system was originally invented in Australia in the mid-1990's. Without any maintenance, the photos on this page show what the PermaTrak boardwalk photo looked like in 2009 and 2014, respectively. 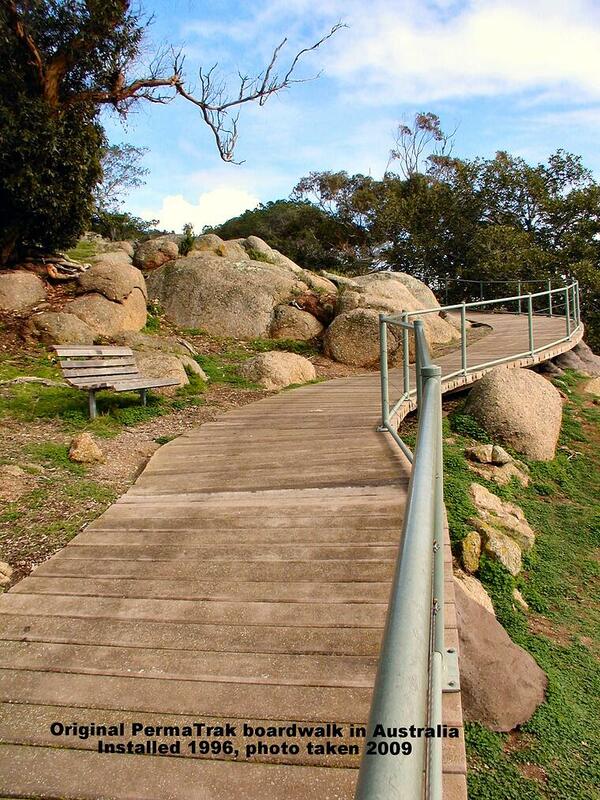 With two common boardwalk materials present on Granite Island in Adelaide, Australia, this project offers a good example of life cycle maintenance numbers. As a popular tourist destination in a coastal environment, both boardwalk materials are subject to harsh weathering conditions. PermaTrak was installed in 1996 during Phase I of this project, totaling an estimated 7200 SF. An Australian hardwood material was installed on an estimated 1350 SF in 1999 during Phase II. Designers saw this hardwood material as more suitable for use as steps up the face of the island. Phase II of construction included a boardwalk, steps and a series of small viewing platforms. "More than a year after flooding rains forced the city to close a section of the Crabtree Creek Greenway, contractors will soon begin repairs on three sections of boardwalk that will allow the trail to reopen by next spring." "On Wednesday, Dean Allen, an employee for Wildwood’s Department of Public Works, ripped up three rotting boards near Sam’s Pizza Palace and replaced them with new ones. Now retired from the Fire Department, Alan comes to the Boardwalk every day to take care of maintenance issues and make sure it remains safe for residents and tourists." "Today, the boardwalk's 25-foot pilings are in good shape, he said, but limited funding has left COA unable to keep up with replacing the walkway’s boards." "The long boardwalk and one on the east leg of the loop are in disrepair, no longer considered safe for public use and will be removed." "It looks like it was built by kids with hand tools," said Mike Tully, the district's chief operations officer. "After a decade in use, many of Volusia County's wooden walkways to the beach are showing their age with warped boards, rusted nails and split wood that can stub toes. Now the county will have to spend up to $2 million to replace or rehabilitate nearly 100 of them over the next five years. 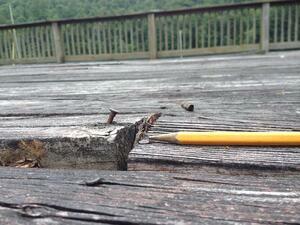 "We have to replace more than a deck board or a railing," said Public Works Director John Angiulli. "These walkovers are in desperate need of repairs." “It’s just about continual maintenance,” Atlantic City Superintendent of Beach and Boardwalk George Tittermary said. Often a single loose board will reveal deteriorating joists the need replacement, he said.